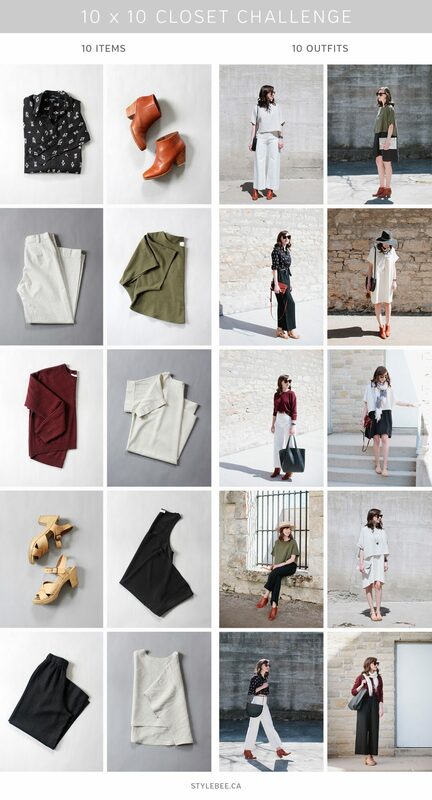 The other day, a friend sent me a link to this post about the 10x10 Challenge, an exercise developed by Lee Vosburgh of Style Bee to encourage herself (and her readers) to get creative with a limited wardrobe. I chafe against this sort of unspoken idea that less is always more, that it is somehow better or more virtuous, to have less of something. Is it inherently wrong for some reason to own two similar black skirts? Is that sinful, or evil, or wasteful? What if I like different things about both of them? Are there rules about how many of something I "should" have? Who wrote these rules? Why can't I write my own? I will restate, I think it is rad for people to do capsule wardrobes and I fully support them. Working within limits and constraints is actually something I think is super productive and can really spark creativity (I'll have to do a whole post on that topic some day because it's something I think about a lot!). I guess what I'm trying to say is that, if you (like me), feel like "Uhhh I don't wanna just wear 10 garments for 10 days because I have this whole closet full of awesome stuff," I'm telling you, that's OK. Capsule wardrobes are not magical and having a capsule wardrobe won't make you a better person! It might be fun and it might spark some creative thinking about your wardrobe and it might even make you want to commit to a different lifestyle where you don't buy as much stuff. That is totally cool! But if it doesn't have that effect on you — it's not because you're a terrible human. Have you ever done a capsule wardrobe? Are you doing the 10x10 Challenge? I want to hear all about it!